This Coconut Oil has been gently warmed to deodorise, removing the coconut taste and aroma. Used straight from the fridge, it’s excellent for spreading on bread, crackers, etc. Coconut Butter is rich in medium chain triglycerides (MCTs), an excellent source of energy, easily digested and useful as part of a weight management programme. MCTs are made of lauric, caprylic, capric and caproic acids. Coconut Butter contains 41-56% lauric acid, known also to possess antimicrobial properties, and 3-15% caprylic acid, known also to contain anti-fungal properties. Coconut Butter also contains myristic acid, used in metabolism for the stabilisation of cell protein. It also contains the Omega 6 essential fatty acid linoleic acid and the Omega 9 fatty acid oleic acid. Unlike saturated fats, like butter, coconut oil doesn`t raise cholesterol levels. In fact, Polynesians who use coconut oil daily are known to have low cholesterol levels. And, unlike margarine, coconut oil contains no toxic trans-fatty acids or easily-rancified polyunsaturated oils. 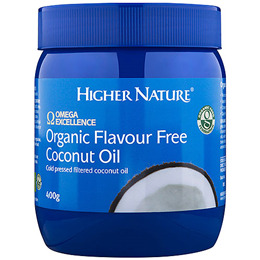 Omega Excellence Organic Coconut Butter is non-dairy. Organic Coconut Butter is packaged in specially-made opaque, recyclable PET tubs, which help protect the oil against harmful UV light and oxygen. Packaged in light and oxygen-protective tubs. The Omega Excellence Organic Coconut Butter is certified as organic by the Soil Association. Below are reviews of Omega Excellence Organic Coconut Oil - 400g by bodykind customers. If you have tried this product we'd love to hear what you think so please leave a review. Unlike vegetable oils, Coconut oil is one of the safest and healthiest cooking oils, because it is heat-stable and does not create toxic trans-fats when heated. Unlike other saturated fats, it doesnt raise cholesterol levels.